Trevor Powers refines his fuzzy lo-fi aesthetic in Youth Lagoon’s second effort Wondrous Bughouse breaking himself out of the bedroom creator niche into the realm of alternate universe creator. Wondrous Bughouse is exactly what its title and cover art suggest – Powers’ construction of a fanciful and sonically interesting world that takes you through the looking glass on a whimsical journey. When compared to The Year of Hibernation, Wondrous Bughouse is more robust in sound and production yet still maintains a lo-fi feel through layered guitars and keyboards and Powers’ identifiable hush-and-mumble vocal style. 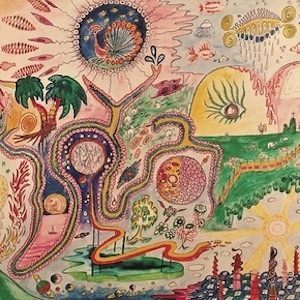 A live drum kit makes noticeable appearances throughout the album (“Mute,” “Pelican Man,” and “Dropla”), an instrument that has yet to make an appearance at any of Youth Lagoon’s live shows. “Third Dystopia” is reminiscent of “Cannons” with its slightly more joyful keyboard melodies allowing the sun to peek out from behind Youth Lagoon’s backdrop of gray. With the exception of the first, all of the songs on the 10-track album are around the five minute mark, allowing Powers to thoroughly explore every uniquely quirky concept to its fullest expression.